Not that anyone would be surprised, but I did a bit of digging on the CEO (since I'm from Sweden as well). I was actually surprised to find one individual in Sweden with a matching name, age and looks. To call him an "entrepreneur" is probably stretching the definition well past the breaking-point though. He is associated with _1_ company, which is his own one-man company (special form of company in Sweden). The company was registered in January of 2014, and has never filed taxes, so there has been (presumably) no income in the company. That's it.. According to LinkedIn, he's been a sales-guy in all previous jobs to this one..
All he has to do is to change the international airline safety regulations to allow items to be shipped that are venting uncontrolled amounts of pure oxygen into a cargo hold. And he will have no problem getting the international laws changed by December! Probably for his next campaign, he will work on getting the laws of gravity changed. And he says that if you are unable to get LOX at your destination, he will refund all your money and you can keep the Triton for free! When asked about the breathing mixture, he seemed to confirm it was pure oxygen. Looked up some data from Dewar manufactures and typical liquid oxygen evaporation rates were 0.2 to 0.8 litres a day. The evaporation and release of the oxygen is essential to keep the remaining LOX cold enough to be liquid. A miniature dewar would have a very small insulating air/vacuum gap between the walls, so how long could it hold any LOX? Could it manage an hour? It would solve all the shipping problems - by the time the miniature LOX dewar reaches an airport for shipping, it is almost certainly empty. That miniature dewar has to contain the double stainless steel walls, and a phase separator to separate the gaseous oxygen from the LOX. To let the LOX get as high as -118 degC to minimize the evaporation rate, it has to allow for pressures of 50 atmospheres, so that would mean the inner wall would be a pressure vessel with strong walls. How much room is left for the LOX? It this were real, you would ship the dewars empty, and get a medical oxygen supplier to fill them at the destination. This is the only cost effective way to get the lo2 I think... but kinda doubt a med supply house will fill a non-medical canister for some random person walking in. I tried several med supply places for syringe bodies, without the needles, and couldn't get them.... and those have zippo regulations. Also Ill mention, I did a quick hand calculation. I have to double check. But I think there maybe problem with evaporating the lo2 at a sufficient rate since you need thermal transfer to do it. I think it may freeze up the device or water in contact, unless you provide some method for forced convection... especially since most of the cylinder will be supposedly insulated. What is the problem with LO2 supply? To make 1kg of LO2 from room temp gas (a temp difference of 25 --183 = 207K) one needs 0.91 kJ/(kg*K) * 1kg * 207K = 188 kJ for the specific heat plus 214 kJ for the latent heat, so roughly 400kJ = 400000 Ws. 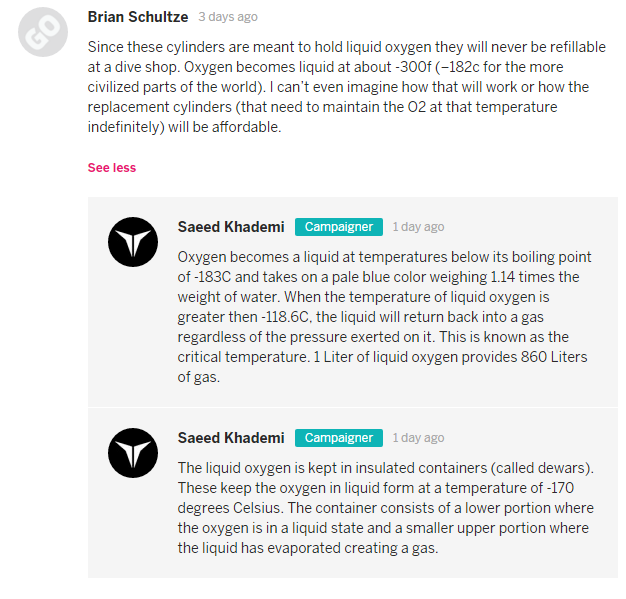 Either this Saeed guy has absolutely no experience with cryogenic liquified gases, or he is depending on his marks having none. This is fantastic news for the people of Sydney. We can not get our Tritons locally now! So does IGG not check anything at all or something? It is against their rules, but so is starting a campaign that is technically impossible. There was a third campaign too, ( https://www.indiegogo.com/projects/triton--5#/ ) that IGG actually did shut down... Or at least it is "Under Review by the Safety and Trust Team"... /laugh. For anyone really interested in this mess, on of the reddit folk wrote a bot to tweet every time a negative Triton post was deleted from the campaign board. I had my uCurrent Kickstarter campaign copied on IGG, it happens all the time. While we're on the humor topic, why not a guaranteed loss instead of a guaranteed loss but with no hope-you-need-to-force-yourself-to-get? I hope that saves some people from throwing their money out of the window. It probably won't, but I applaud the effort (and tossed in a Euro as well). 2nd from me. Can't wait to get my nothing! Wait, did you ask for two nothings?